Our mosaic trash cans can bring your public space to life! • Completely customizable to showcase the brand and story of your neighborhood, city, company, park and more. Include logos, photos, textures, materials and other images to personalize. • Unique, handcrafted design goes into EACH product - let us choose the color scheme and material or we can work with you on specific needs or theme. • Order one piece or many to bring together a whole neighborhood or campus! 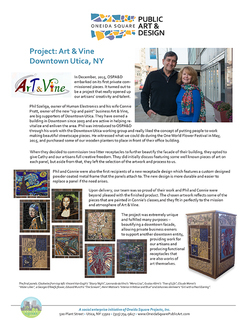 Art & Vine – where we turned eight famous pieces of art into mosaics. 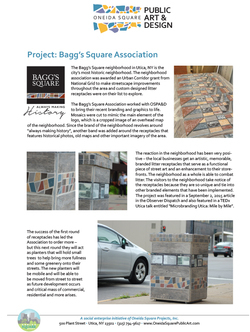 ​Download a case study on our litter receptacles for Bagg's Square – Utica, NY's most historic neighborhood.